Life promises to be a lot easier when all our devices are communicating with each other. We’re all familiar with the Internet, and the way it connects humans to one another and to vast amounts of data. But computer visionaries foresee the day when not just humans but all our devices are connected to each other via the Internet. This so-called “Internet of Things” (IoT) would make possible all manner of transformative technologies, from digital sensors that allow crops to report when they are thirsty or under attack by insects to parking spaces that alert us when they’re available to tiny implants that continuously monitor our health as we go about our lives. That long-anticipated day is still a ways off, because at this point the Internet of Things might more accurately be described as an Internet of Costly Things. “Today’s radio technologies cost at least $4, making them too expensive for embedding into objects at scale,” says Dr. Joshua Smith, a professor of computer science at the University of Washington in Seattle and a leading expert on wireless systems. The high cost comes not just from the radio transmitters needed for systems like Wi-Fi and Bluetooth but also from the batteries they need for power. So Smith and his team set out to build a low-cost communications system that doesn’t need batteries or the energy they provide. Communicating without energy might sound impossible. But it isn’t — consider a shipwrecked sailor who signals rescuers by reflecting sunlight from a mirror. Smith and his colleagues have developed a so-called “backscatter” system that works in a similar way: a tiny antenna either absorbs or reflects radio waves from a transmitter, such as a normal household wi-fi router. This creates a faint but distinctive echo of the original signal that can be detected and decoded by a receiver even over significant distances. Because they have no power-hungry transmitter, Smith says, backscatter devices can get all the energy they need from thin air — or, rather, from the radio and TV broadcasts that fill it. At home, that could mean a single wi-fi router talking to dozens of tiny devices mounted on fridges, doorbells, and the like. How about a smart coffee mug that tells you when your favorite beverage is getting cold? And out in the world, the IoT could save crops or bust traffic jams. “What you’d like to have is thousands of devices that are extremely low power, potentially battery-free, and able to communicate at long range,” Smith says. In a recent paper, his team demonstrated a backscatter chip that could send information to a receiver as far away as a mile and three-quarters. That’s far enough to work across all but the biggest farms, not to mention throughout a family home or even a large office. Smith says the backscatter chips could be manufactured for less than a quarter apiece. He thinks that should be inexpensive enough to unlock dozens of IoT applications, including smart homes that heat or light rooms only when humans were present and bridges that signal when they’re about to fail. But Smith is convinced that the most exciting uses for the technology will be medical. In a recent experiment, his team built backscatter into a soft contact lens and placed it in contact lens fluid to simulate being in an eye. A receiver was able to pick up data from the lens from across a room. 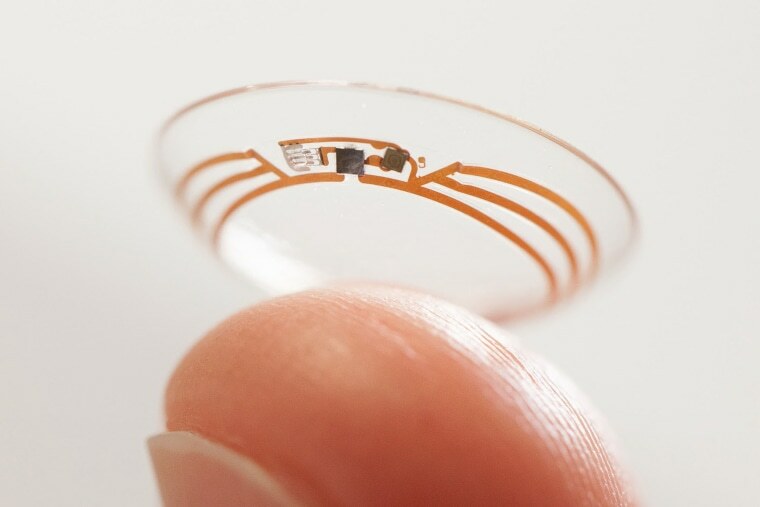 Both Google and Apple have worked on medical contact lenses for detecting blood sugar levels from tears. In the future, these could enable diabetics to avoid painful and inconvenient blood tests. Smith’s team also made a prototype skin sensor to be worn as a sticker. Such a wireless sensor would enable simple, continuous monitoring of vital signs like temperature, sweat, and cardiac activity. Or imagine an implant that could warn medical staff it was malfunctioning. Though Smith previously demonstrated making phone calls and even sending video over backscatter, he is now concentrating on perfecting IoT devices like these that generate only trickles of data. “But when you add together thousands of sensors, the net amount of data coming into one reader may be quite high,” he says. Smith isn’t the only one who sees the promise of backscatter. “This is a very promising technology, which when combined with other techniques for precision positioning, could really open up the internet of things to a wide world,” says David Mindell, CEO of Humatics, a Cambridge, Massachusetts-based firm that is building an indoor GPS-like location system. Smith has formed his own startup to commercialize his backscatter technology. Even if his battery-free systems prove tricky to build, other companies and consortiums are working to make the IoT a reality. It might take awhile, but when plants and vehicles eventually outnumber people on the internet, the world will be a much smarter place.